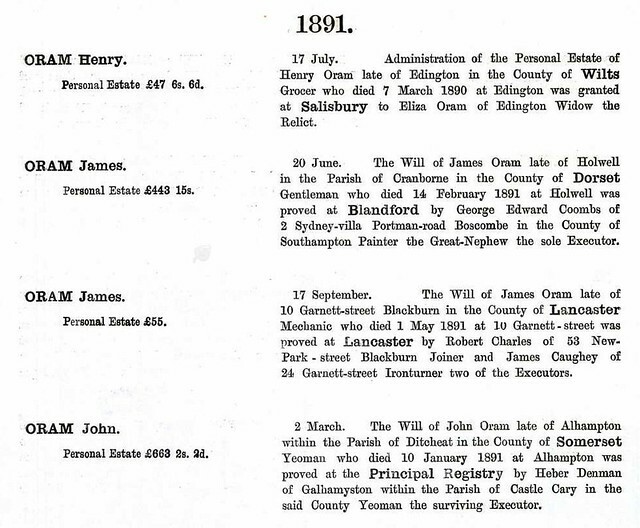 There is sufficient family documentation to establish that this John Oram was the son of John Oram born 1772 in Ditcheat, though he is often referred to as living in Alhampton that is a hamlet within the parish of Ditcheat. Research is required to establish the spouses and offspring of both Johns. Starting with the 1841 census there were seven Orams living in the same household in Alhampton. It looks like a family group consisting of mother, a son, either two daughters or a daughter and daughter-in-law and three grandchildren by resident or absent son(s). In the 1841 census ages of adults were normally given to the nearest five years. School mistress, 70 year old Mary Oram was probably John’s mother. The 51 year old Mary would have been John’s sister, but 45 year old Ann could have been John’s wife or sister. The birth certificate for Ann Oram, daughter of John Oram born in 1837 in Ditcheat is almost certainly for the three year old Ann in the census. The certificate gives Ann’s mother’s name as ‘Ann Oram formerly Davis’ but to confuse matters in the 1871 census John is living with his sister Anne born 1793. In the 1841 census peoples’ married status was not recorded, from 1851 onwards they were, so we know that John was a widower by 1851 and could have been in 1841. 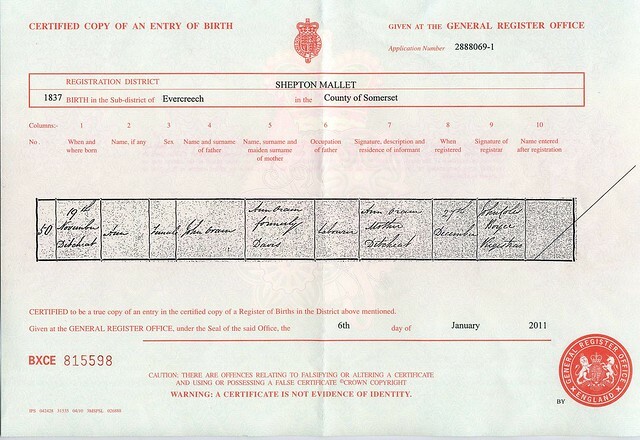 There is a death certificate for Ann Oram who died early 1838, who could have been John’s wife dying a month or so after registering the birth to her daughter Ann on 27 December 1837. The 1851 census confirms that Mary, Sarah and Ann are daughters of John, agricultural labourer by then definitely a widower living in Tinney’s Lane, Ditcheat. John’s mother Mary is still the local school mistress, living with her daughter Ann, a knitter while her other daughter Mary is housekeeper to a family in Castle Cary. Mother Mary had probably died by the 1861 census as by then her daughter Ann was the Alhampton Infant School mistress living with her ‘lodger’ sister Mary. John was with his two daughters Mary and Sarah. John’s sister Anne [sic] is living with John in the 1871 census along with John’s daughter Mary, now Mary Cox and her five year old son John Oram Cox. Mary had married George Cox in early 1865. John Oram Cox had been born in Pilton, Somerset and was to die in 1876. Sarah had moved to North Cadbury where she was companion to Frances Coleman, the 82 year old aunt of William A Court. In the 1873 Return of owners of land in England John Oram of Ditcheat, Bath owned land totally 2A 0R 31P with a Gross Estimated Rental of £21. 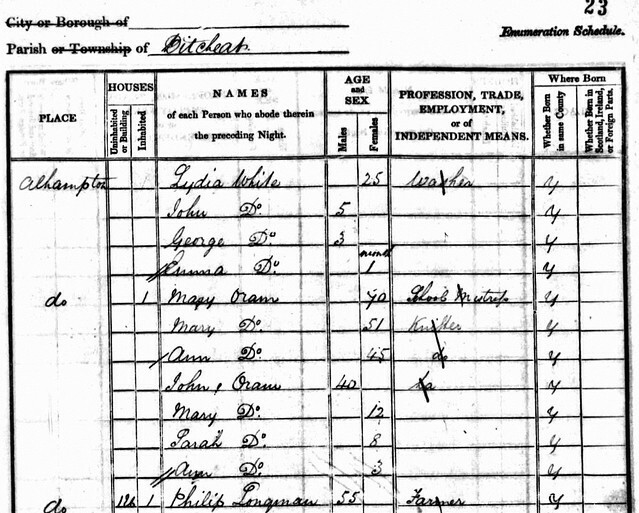 In John’s last census in 1881 he was living with his married daughter Mary Cox. Sarah has married William A Court, his aunt is still alive and they have no children. William and Sarah may be the couple in the 1891 census who were living in Castle Cary. Both were still working in their 60s, William as a general labourer and Sarah was a working in a texile mill as a chain warper. John died on 10 January 1891 and his funeral was held on 15 January at Ditcheat. His estate was valued at just over £663. This line of the family appears to have died out unless John’s youngest daughter Ann or any unaccounted for siblings of John married and had offspring.